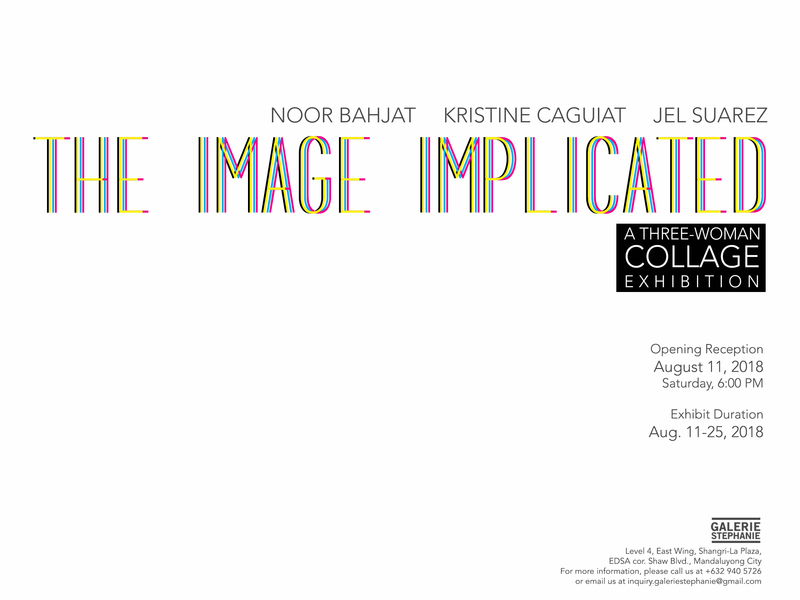 This August, three collage artists, Noor Bahjat, Kristine Caguiat, and Jel Suarez mount a group collage exhibition entitled, The Image Implicated at the modern and contemporary art gallery Galerie Stephanie. 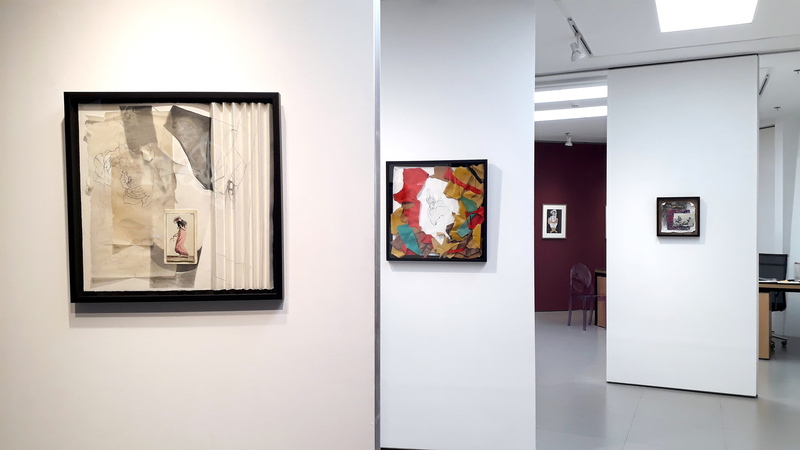 The exhibit’s opening reception will be held this Saturday, the 11th of August, 6 o’clock in the evening at the gallery’s new location on the 4th Floor of Shangri-La Plaza, East Wing, Mandaluyong City. 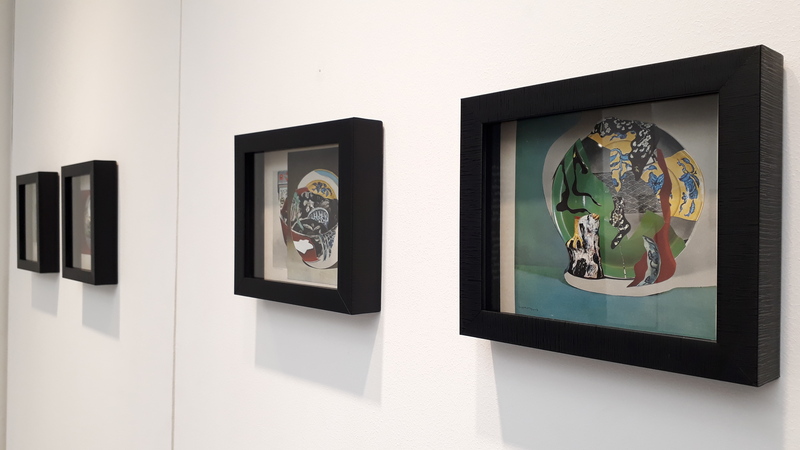 While made famous by 20th century Cubists Georges Braque and Pablo Picasso, nevertheless collage has existed since the invention of paper more than 2,000 years past. 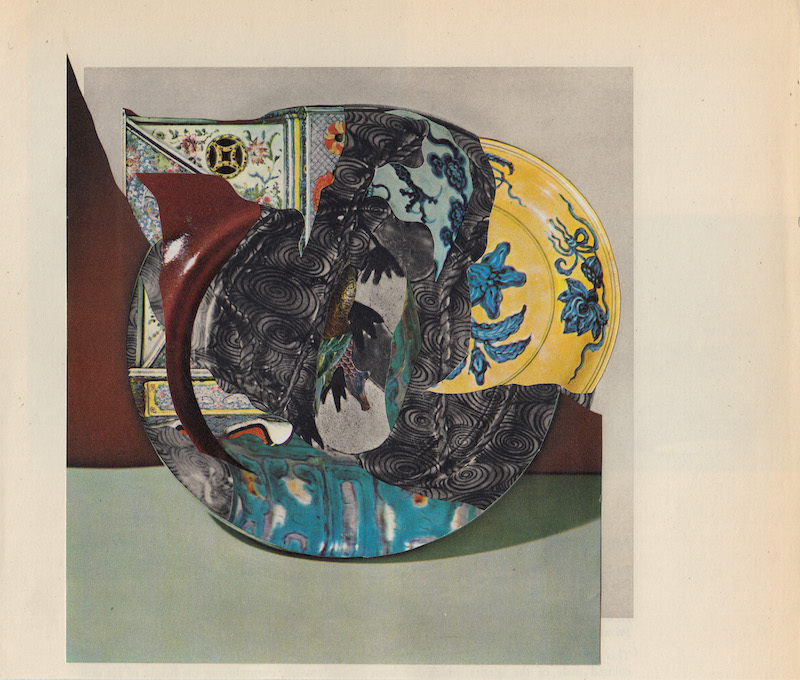 Popularized further by the European avant garde and American Pop artists, the juxtaposition of various image fragments thereby questioning the traditional delimitation between ‘high’ and ‘low’ art forms, has seen ubiquitous proliferation in the global art world. 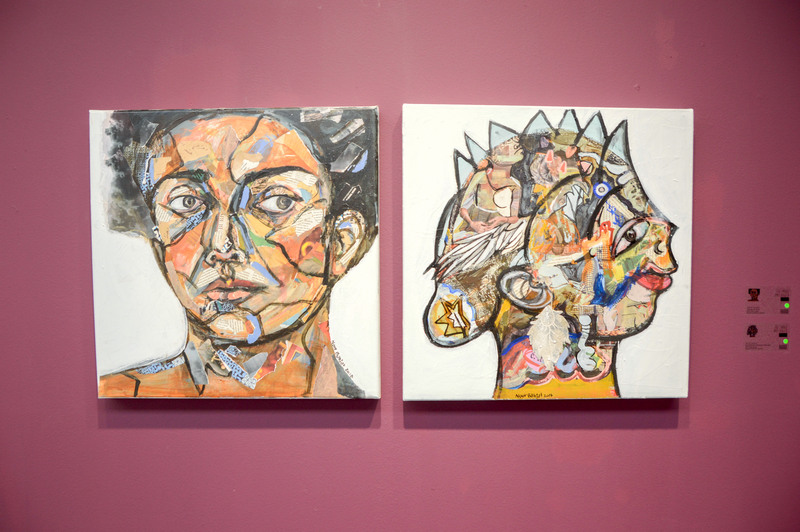 In the group exhibition The Image Implicated, two Filipina artists Kristine Caguiat and Jel Suarez, and Syrian artist Noor Bahjat explore and further the artistic practice of cutting out and re/constructing. 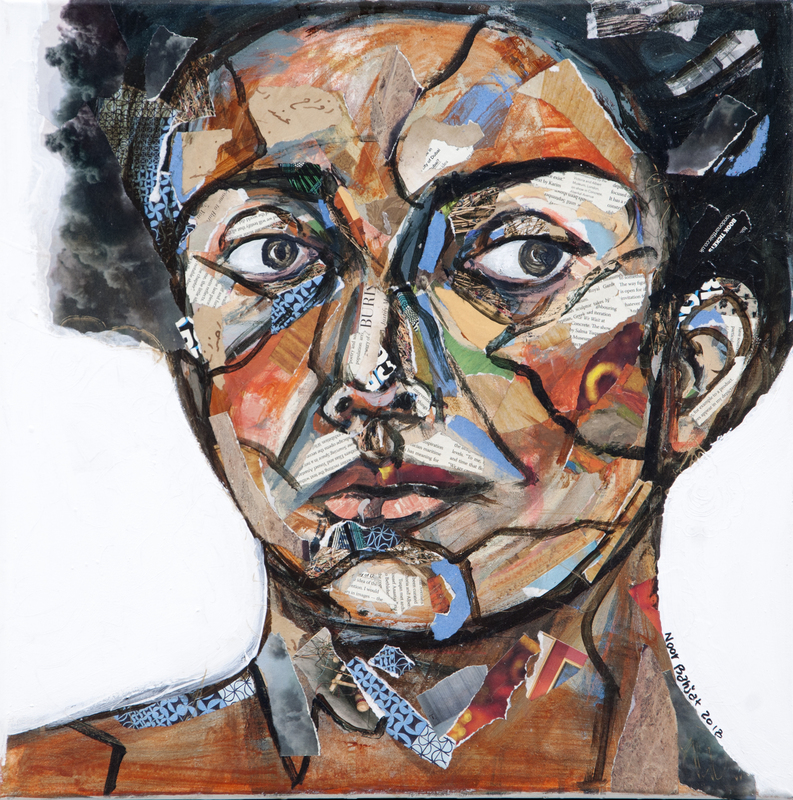 Noor Bahjat was born in Damascus, Syria but relocated to the United Arab Emirates before the height of the Syrian Civil War. 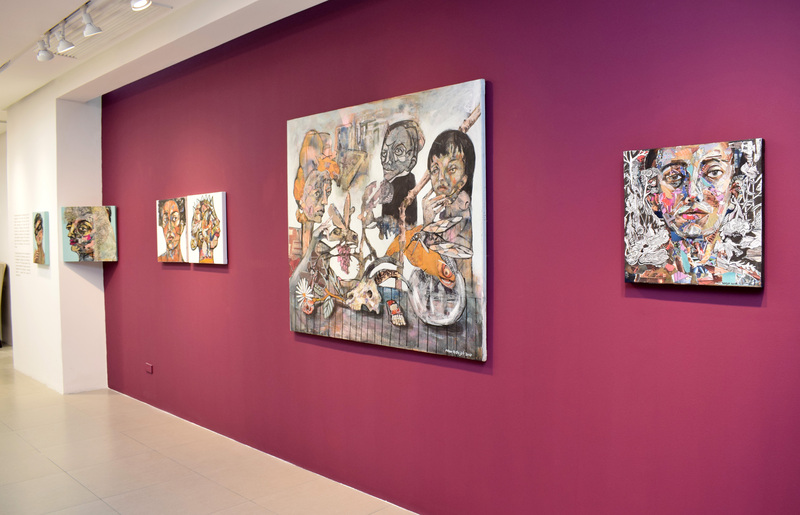 After graduating with honors from the University of Damascus’s Faculty of Fine Arts, Noor was swiftly recruited by the prestigious Ayyam Gallery (Dubai) to participate in a yearlong residency, as well as Galerie Stephanie’s artist residency program soon after. 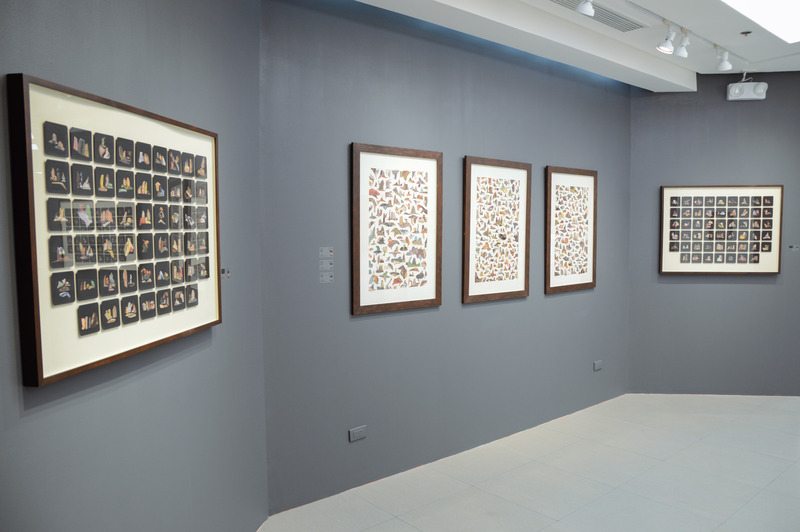 She has had two solo exhibitions and 13 group exhibitions in Syria, the Philippines, UAE, and South Korea. 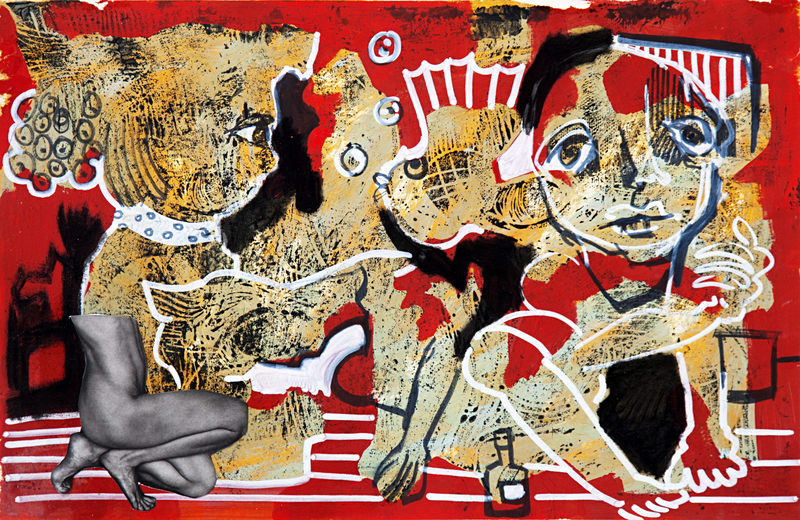 Strongly figurative and unapologetically expressionist, Noor often places herself as her works’ central persona around which heavily loaded symbols, collages, and illustrations swarm about. 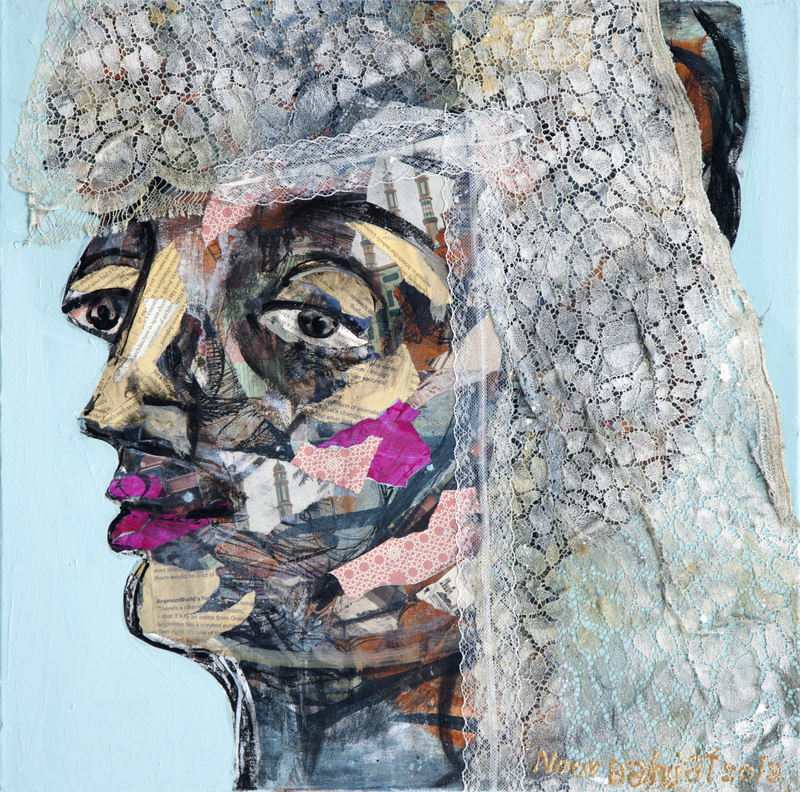 For Noor, the presence of the collage’s materiality brings her expressionist painting to the fore, highlighting her persona’s malleability against the rigidity of the ‘real.’ In this exhibit, she uses women’s objects – an opulent earring, a wedding veil, a tiara – to evoke situations specific to the female experience, building the female shape from her accrued surroundings and experiences. 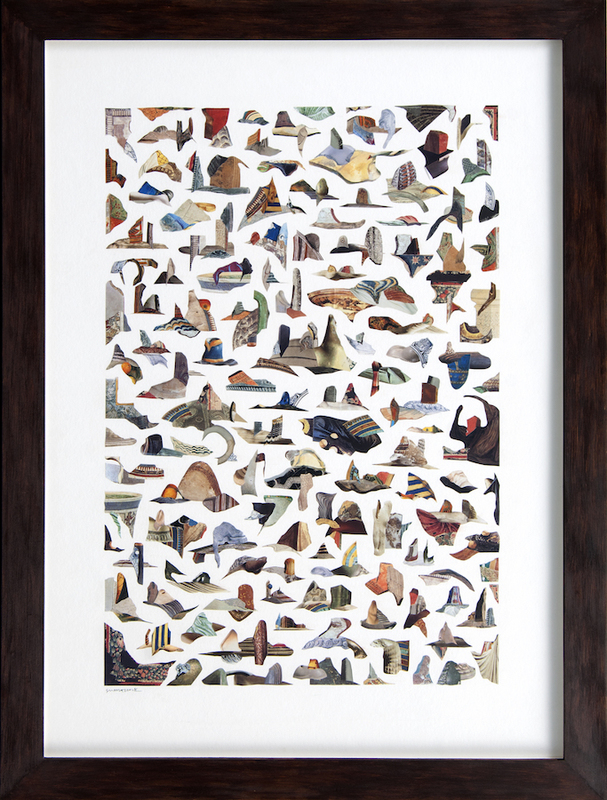 A collage artist, illustrator, and graphic designer, Kristine Caguiat graduated from the Ateneo de Manila University and afterwards received certifications in Art Theory and Illustration from the Slade School of Fine Art in London, and the Peking University in Beijing. 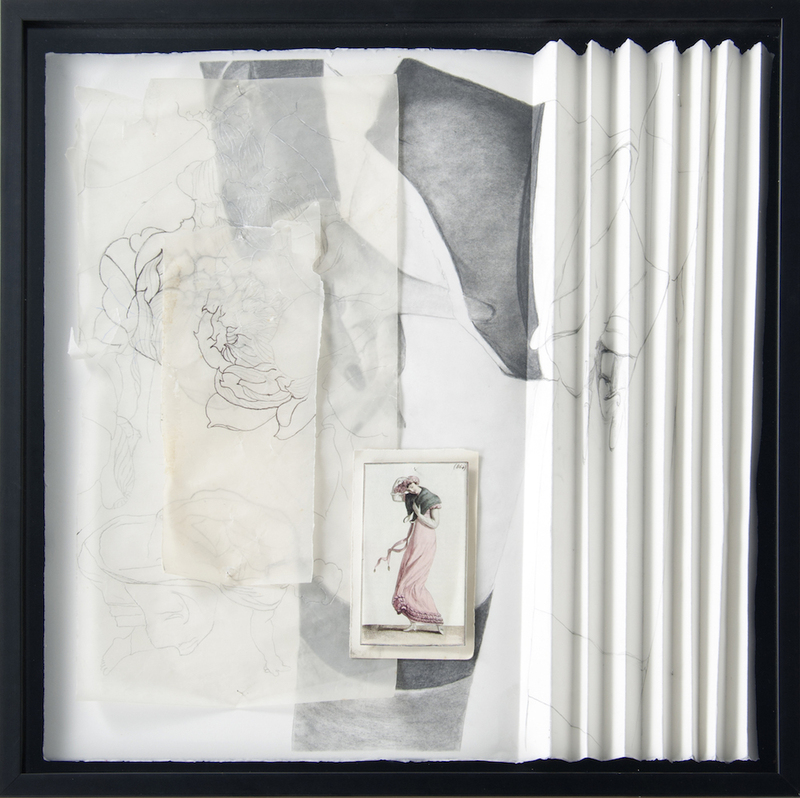 Kristine has participated in 16 group exhibits at J Studio, Blanc Gallery, West Gallery, and Art Cube Gallery among others, juggling her artistic career with a full-time corporate job. 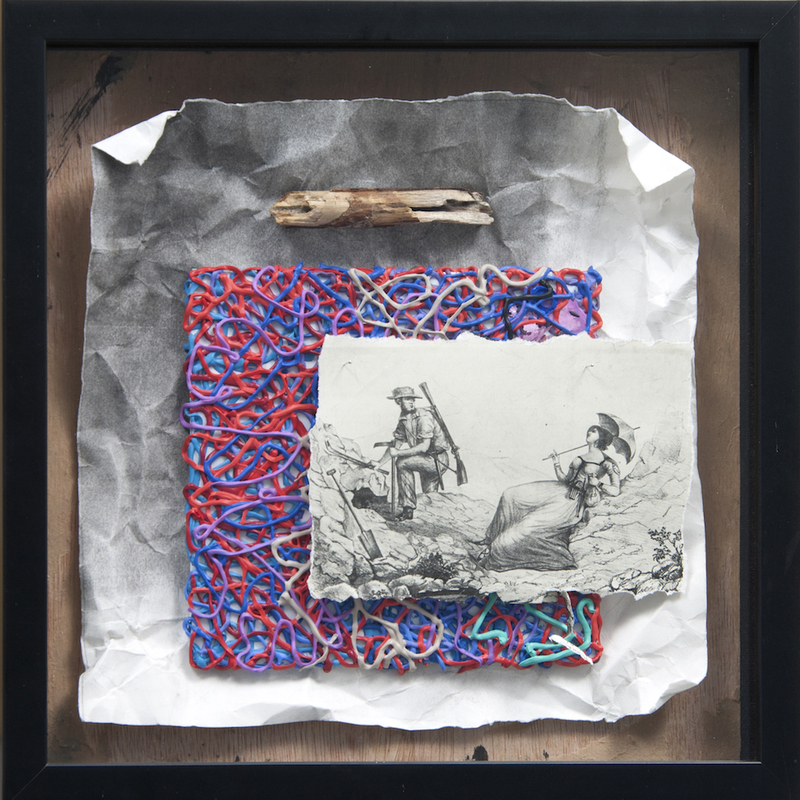 Kristine’s artworks explore her fascination with immortalizing the transitory, while examining societal issues as they manifest in the mundane and everyday. 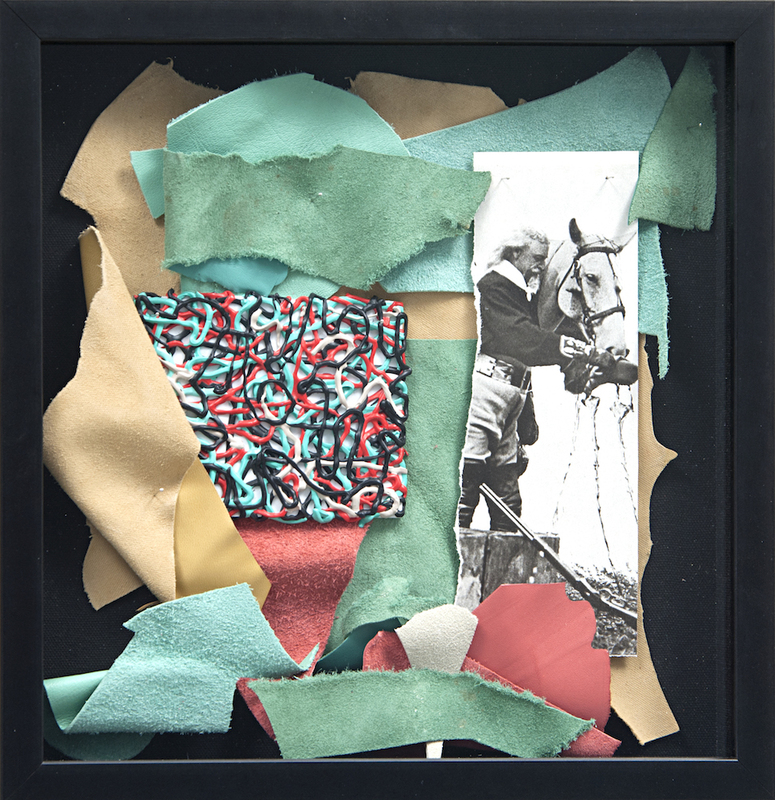 She takes fragments of material – glimpsing the larger constructs they implicate – and re/creates narratives old and new, familiar yet adulterated. 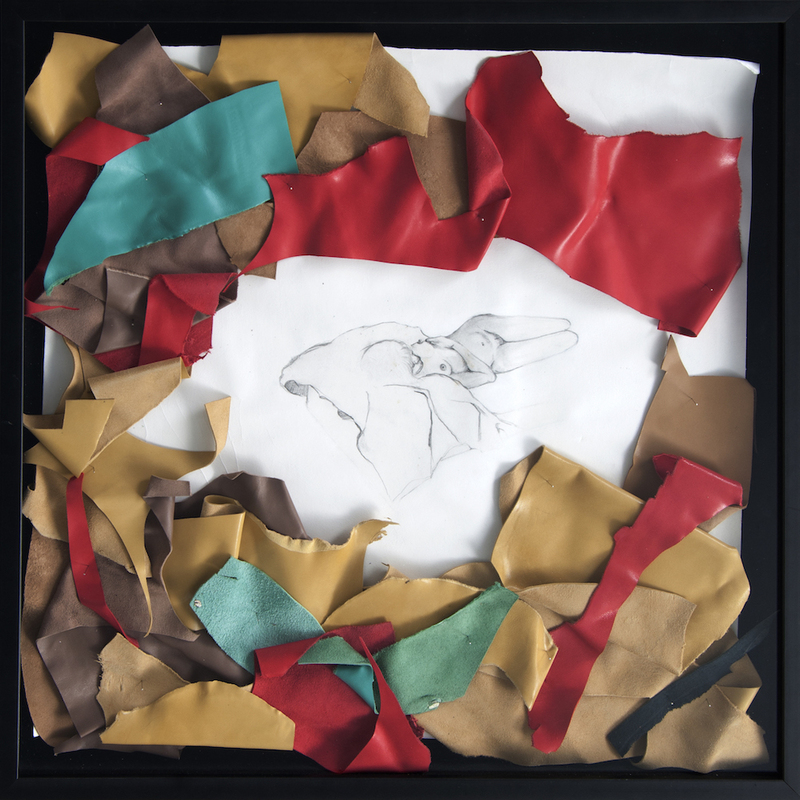 In this exhibit, Kristine delves into sexuality as both deviation and social construct, depicting concurrences of sexual liberation and shame, as well as skewed understandings of both as one is caught in the interstice. 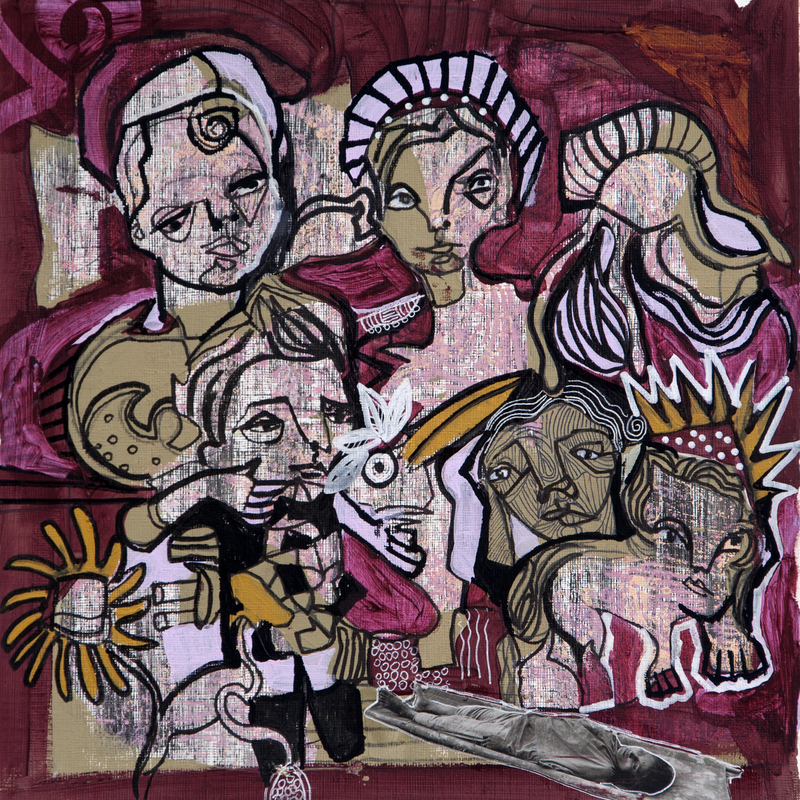 Originally a Psychology graduate specializing in Special Education, Jel Suarez is a formidable newcomer in the contemporary scene; having been shortlisted at this year’s Ateneo Art Awards after only four years as an exhibiting artist. 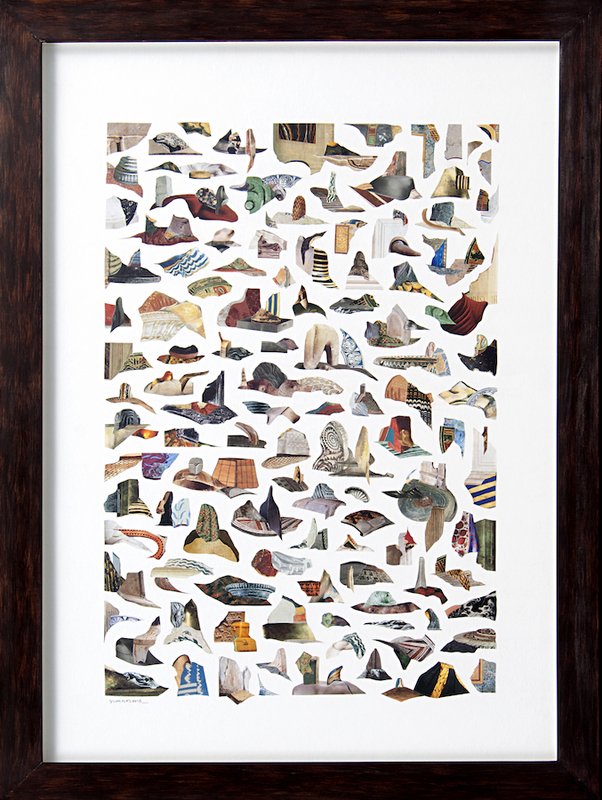 Jel has mounted one solo exhibition a year at West Gallery, Underground Gallery, and twice at Vinyl on Vinyl; participated in art fairs in the Philippines, Hong Kong, Taiwan, and Singapore; and joined 15 group exhibitions, this exhibit being her 16th. 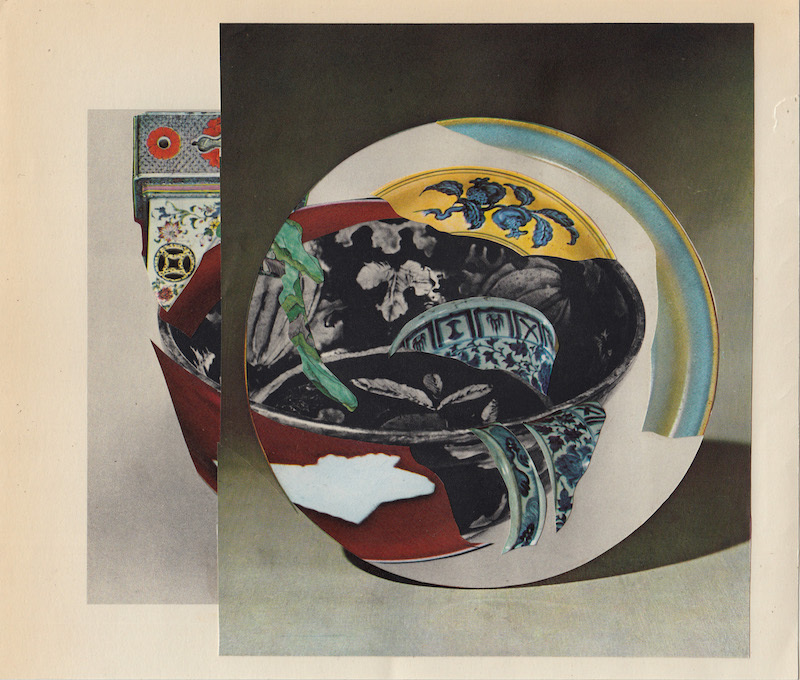 Purely a collage artist, Jel clips from narrative-based materials like books, catalogues, and archives, extracting fragments in a fixed, almost instinctual process, and rearranges them in landscape-like rhythmic configurations. 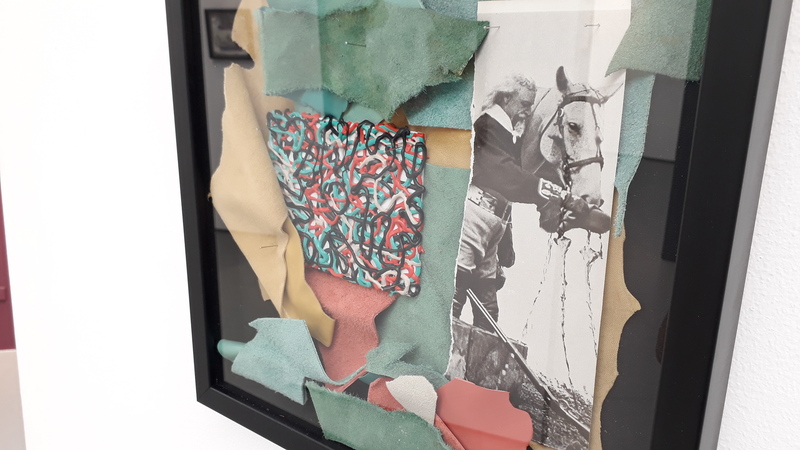 Her aesthetic perspective sees the details of images not as part of its whole, but as potentially part of something more overarchingly complex. 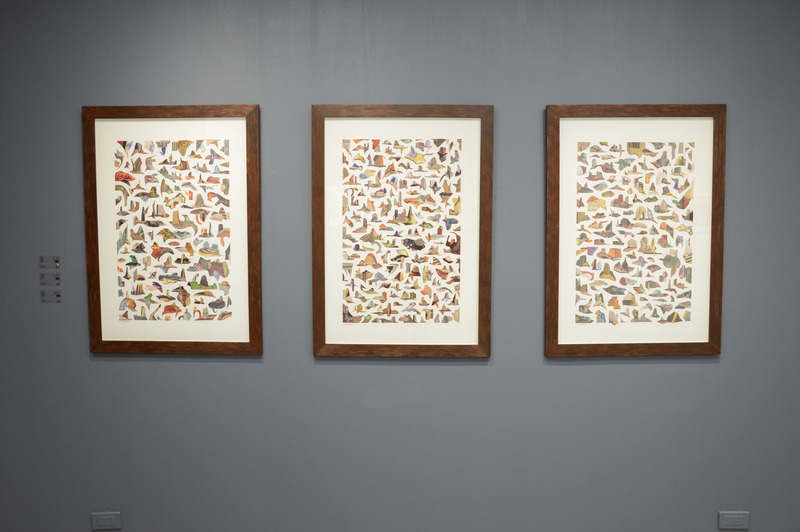 The end result resembles poetic cairns whose twofold intervention – first created and printed, then cutout and reconfigured – symbolically reveals a fractured, yet beautifully connected past. 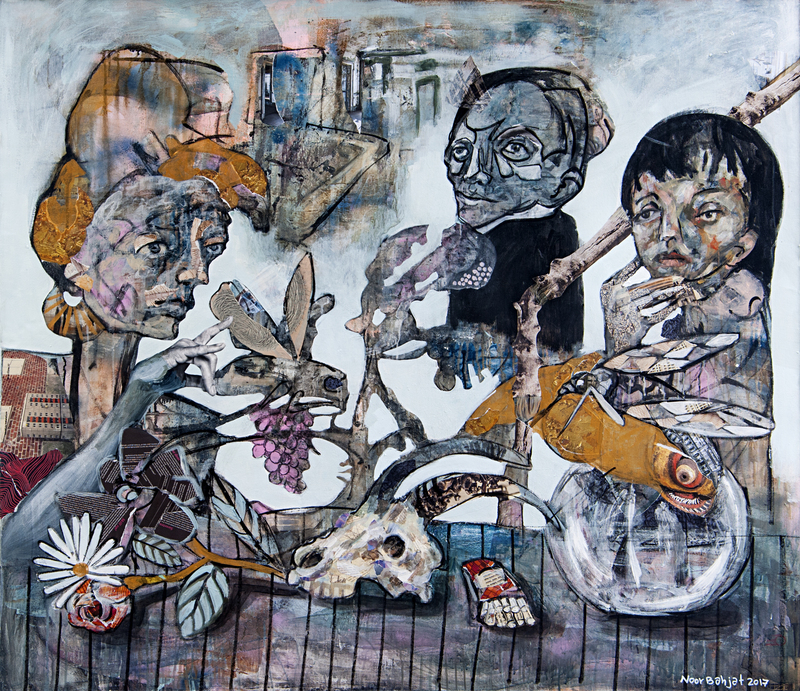 The three woman exhibit, The Image Implicated highlights the technique of collage while celebrating its versatility as a contemporary medium. 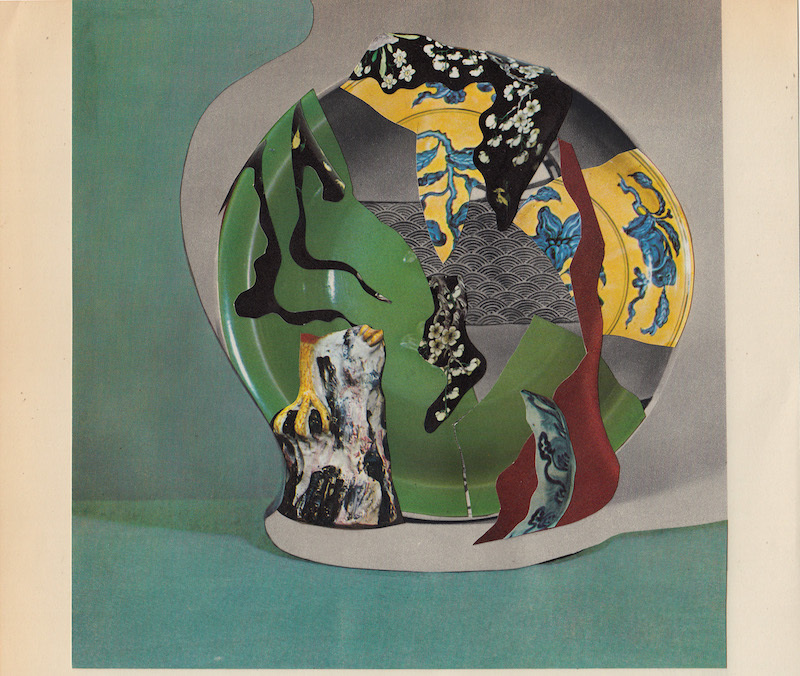 Noor Bahjat, Kristine Caguiat, and Jel Suarez use it to great effect, weaving narratives from existing threads, as they coerce elaborations from the media that constitute our daily orbits. 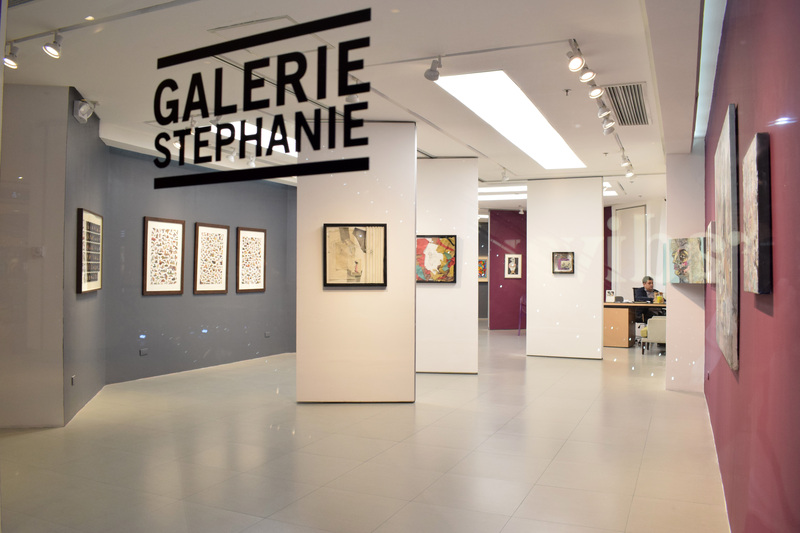 This exhibition will open at Galerie Stephanie located on the 4th Floor of Shangri-La Plaza, East Wing, Mandaluyong City on Saturday, the 11th of August, 6 o’clock in the evening. It is free to view and open to all, and will be displayed until August 25, 2018. 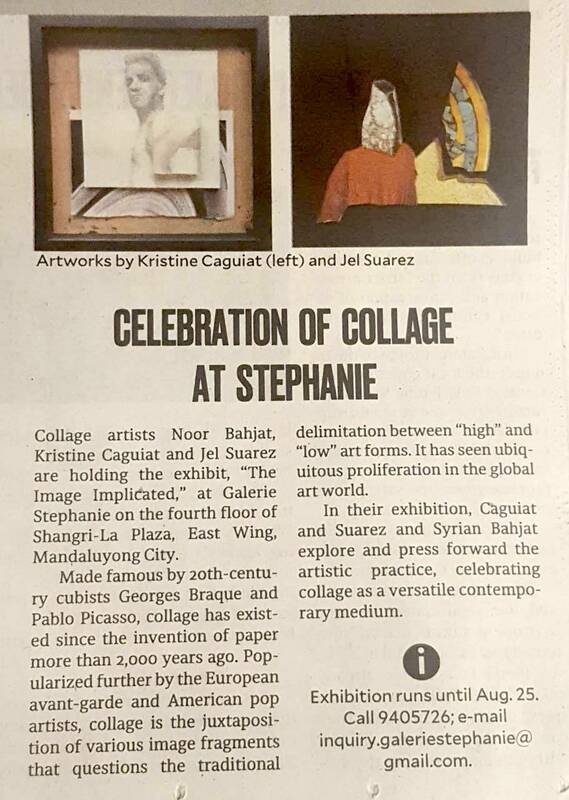 For inquiries and more information, contact the gallery at (02) 940-5726 or send an email to inquiry.galeriestephanie@gmail.com.